Recipe from Real Simple Magazine, Adapted from "The Barefoot Contessa Cookbook" (Clarkson Potter/Publishers). Preheat oven to 325 degrees. Line mini muffin tins with mini muffin paper liners; set aside. Sift together the flour, baking powder, baking soda, and salt into a medium bowl; set aside. In the bowl of an electric mixer fitted with the paddle attachment, cream the butter and sugar until light and fluffy, about 5 minutes. With the mixer running on low, add the eggs one at a time. Scrape down the bowl, add the vanilla and almond extracts, and mix well. Alternately add reserved flour mixture and the buttermilk to the batter, beginning and ending with the flour. Mix until just combined. Fold in half the coconut. Fill each liner to the top with batter. Bake in oven until a cake tester comes out clean and the tops begin to brown, 20 to 30 minutes. Remove cupcakes from tins, and place on wire rack until completely cooled. 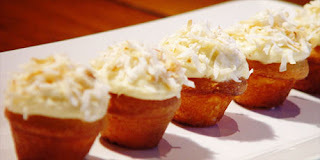 Frost with cream cheese icing, and sprinkle with remaining coconut. In the bowl of an electric mixer fitted with the paddle attachment, blend together the cream cheese, butter, vanilla, and almond extract. Add the confectioner's sugar, and mix until smooth.